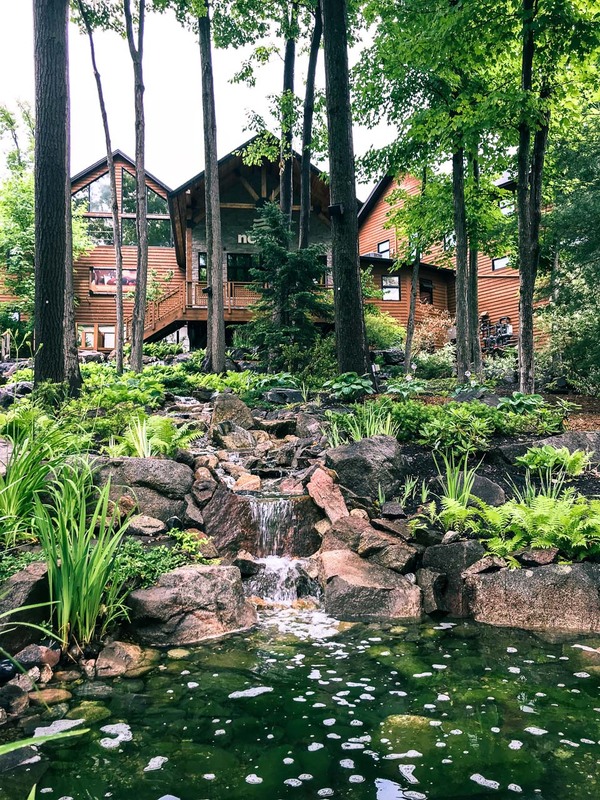 Just a 20 minute drive from downtown Ottawa is a quiet forest oasis known as the Nordik Spa Nature. 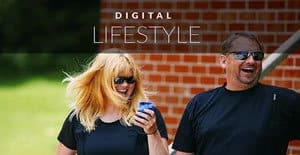 We arrived an hour before opening to capture photographs and video of the spa before putting away the cameras and cell phones for the day to completely indulge in peace and relaxation. 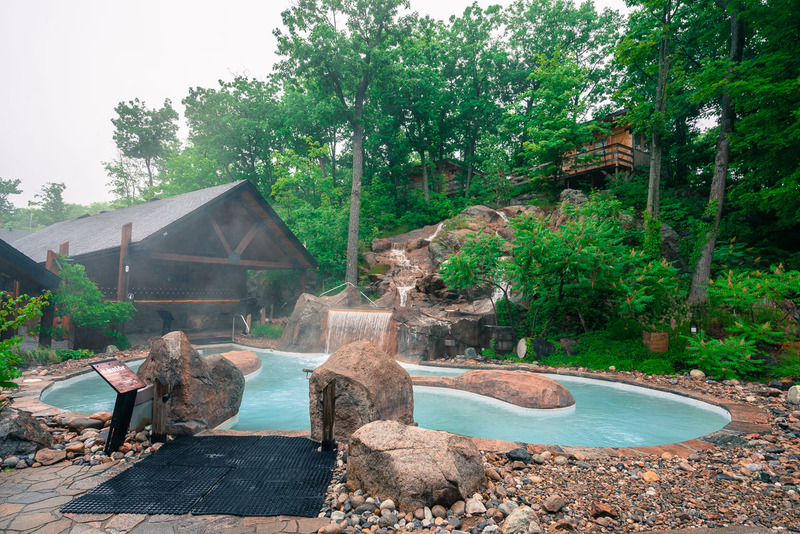 Note: Cameras and Cell phones are not allowed in Nordik Spa. We had permission to film on the grounds before opening and then put our cameras away. Some photos in this post are courtesy of Nordik Spa. 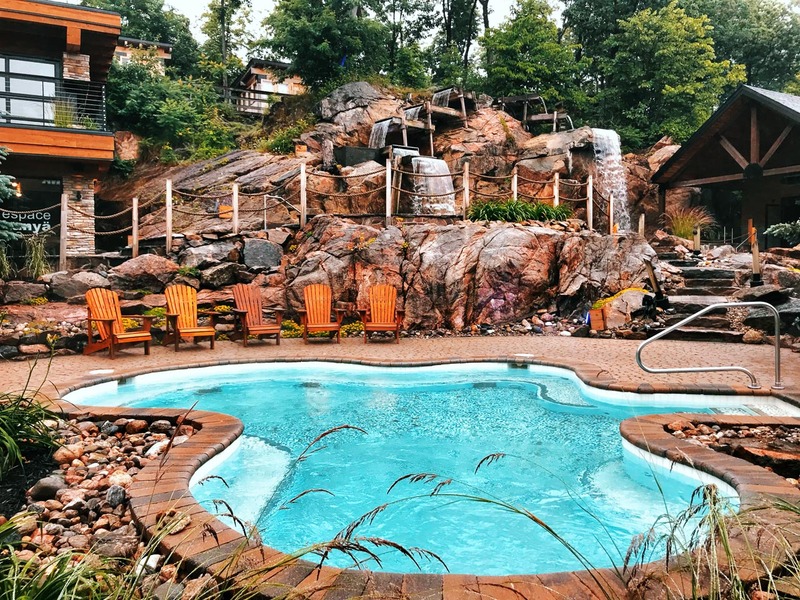 Our visit happened in the middle of summer during an intense heat wave but the Nordik Spa is open year round. Some of the best times to have a Scandinavian experience is during the dead of winter. 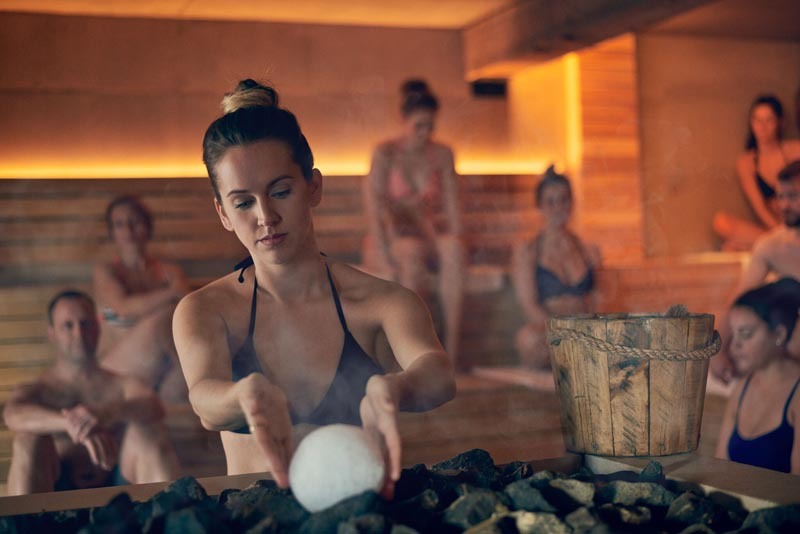 Nordik Spa Ottawa is all about going through the spa rituals of heat, cold and rest. The saunas and steam rooms give you the heat, the winter air gives you the cold, and the many mediation rooms and lounge areas offer rest. 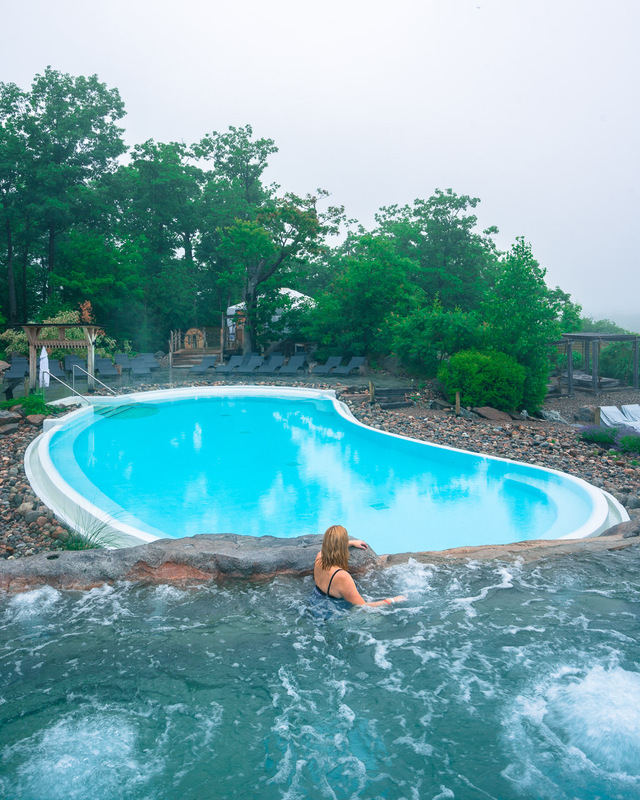 In the summer you plunge into cold pools and sit under waterfalls for the cooling effect. Arriving early is a must to the Nordik Spa. When we shared our experience on social media, many people told us it was overcrowded when they were there. That was not the case for us. Getting into the pools at 9:00 am sharp gave us an entire morning of seclusion. We didn't notice the crowds until leaving at about 2 pm. We have also heard that weekdays and evenings are much quieter than during the day. Tip: I would avoid any time between 2-5 pm if you want to be free of crowds. The property is huge and even if there are people in one pool, chances are you can go to another for solitude. 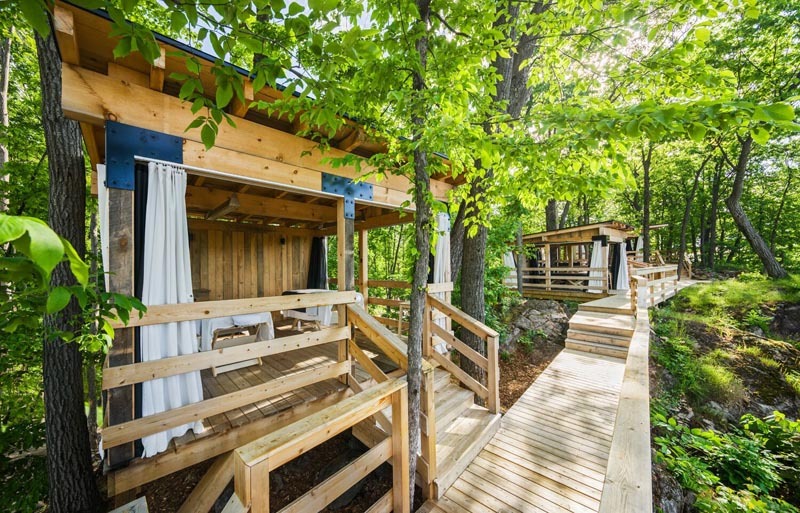 Day passes start at $65 and includes access to the saunas, baths and relaxation areas. Be sure to pack your own flip flops and bathing suits. You can bring your own robe or you can rent one for the day. One towel is provided, but I would suggest bringing another. There are food packages, wine and cheese packages, massage packages and extra sauna and bath experiences. You can spend the entire day and evening here and never get bored. In fact, you'll feel complete peace and calm. A highlight of our visit was spending 40 minutes in the Källa Treatment. 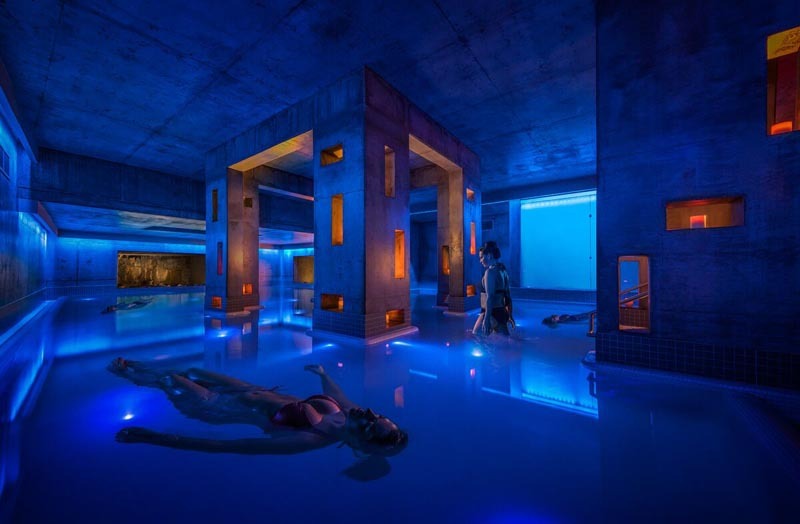 Källa is an indoor saltwater pool dug into 5 metres of rock consisting of 10 tons of Epson Salt. It's an extra $45 but it is worth it. 40 minutes in here is equivalent to 3 hours of sleep. We went to the salt pool first and had it all to ourselves. It is calm and quiet with soft music playing above and below the surface of the water. 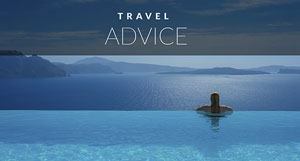 With the same density of the Dead Sea, it is your time to lay in the water at zero gravity. If you have any sore muscles or stress, it instantly melts away as all tension releases from your body as you get lost in the experience. We let our minds drift feeling as if we went into a trance floating effortlessly through the pool. If you have never had the chance to experience what it's like to float in the Dead Sea, this is the next best thing! After setting the tone for the rest of our visit inside the Källa Treatment we felt relaxed and ready to experience the rest of the spa. We were determined to make the most of the treatments. I've been suffering from a frozen shoulder for years and Dave has severe sciatica problems, so this spa was just what the doctor ordered. So we followed the advice of the Thermal Treatment Cycle. The Thermal Cycle is based on a 2000 year tradition founded in the Nordic Countries of Scandinavia. I will not lie. Our favourite part was the heat part and we definitely overdid our amount of time in the saunas and hot pools. The heat experience happens in different saunas dry and wet or steam. There are nine to choose from. Cold can be going into the plunge pools o dipping under cold waterfalls. We tried our best and managed to pop into a few cold spots. Other than Deb standing under a waterfall for Dave's photographs, we most likely didn't get the full recommended 10 seconds. With 10 baths to choose from, we had our pick of places to relax. From warm pools, to lounge chairs and meditation rooms, Nordik Spa offers several areas to meditate. The infinity pool and it surrounding baths are located near the snack bar and Biergarten. This is the one spot in the spa where you can talk freely, and enjoy a drink or snack. The rest fo the grounds are for quiet. We didn't like it here so much, but perhaps if we were sipping a beer with friends, we'd spend more time. After only a quick dip in the infinity pool, we tired of the chatter and made our way to the quiet areas. When going to a spa, I love just being. It isn't often in life that you are forced to relax, but at Nordik Spa, it's easy to let go and be one with your thoughts. This was more our speed. We decided to start with the hottest first and went into the Maa Sauna. It's the hottest of them all at 95-100 degrees and is a place to quietly meditate. We only lasted a few minutes in this one before escaping to the warm outdoor air in search of a more tolerable sauna. The Tuli Sauna fit the bill. This meditative sauna is less hot at 85 degrees and its octagon shape around the wood stove made for a comfortable experience. To sit on the teak wood bringing our legs up to our chest as we let the heat radiate down our spines was heavenly. I could have sat here forever. But 15 minutes is the max, so we ducked outside to cool down. I could only manage to get into the cold pool up to my waste. 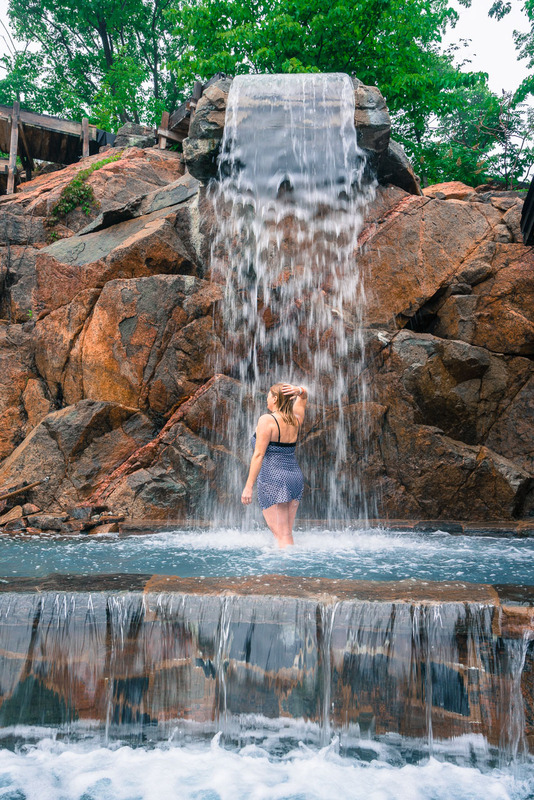 It cooled me off quickly, but I felt guilty not following the program, so I did a quick dip under the cool waterfall to bring down my body temperature. Feeling invigorated from the cool, it was time to seek out a meditation room that felt comfortable. Wrapping up in our robes, we found a quiet spot to chill out. Dave is great at meditating and I am working on clearing my mind. It was raining outside, so we opted to relax in one of the indoor rooms over the many lounge and patios. Our favourite was the Tellura Room where we lay on heated stones in silence. The heat felt incredible on my back. We constantly sought out quiet meditation rooms that were gently heated with stones or wood. But there are pavilions, hanging beds, and rooms with lounge chairs, or the bar by the pool. However you want to relax, there's a space for you. Our next stop was the Aromi Sauna where a therapist brought in a snowball infused with lemongrass to fill the room with aromatherapy. She set it on the hot rocks and as it melted in the heat, we felt rejuvenated by the smell and relaxed by the heat. One of my favourite saunas are the wet saunas where you pour water over hot rocks to create vapour. 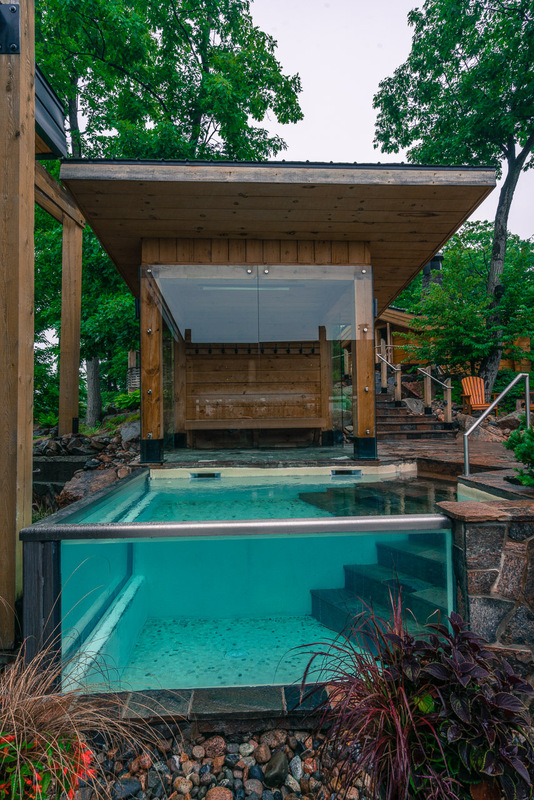 This sauna lets steam creates temperatures reaching over 100 degrees in the largest sauna on the property. 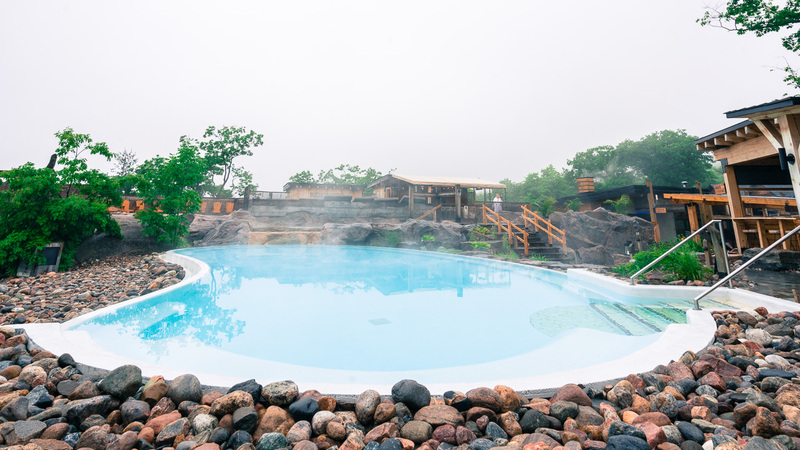 After having this spa, we went over to the salt pools where we exfoliated our skin with aroma salts before having a cool shower. We stuck to our heat, cold, relax ritual by going to one of the warm outdoor tubs to relax after our cool shower. As waterfalls cascaded nearby, we melted away in the warm pools taking in the misty air of the rainy day. 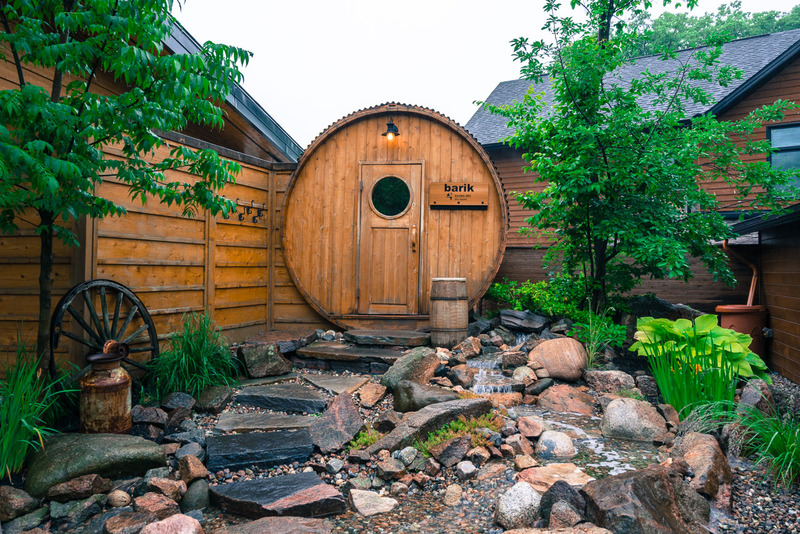 The Nordik Spa's Russian Sauna is a unique experience. You can also book a 1 hour experience that involves 4 steps. 1 – Infusion with birch veniks – birch broom is infused with essential oils. This type of sauna combines the dry nordic saunas with the hot steam baths of hammams. We weren't organized enough to give the Aufguss Ritual a try. It happens every 2 hours starting at 11:00 am, but with no way to tell the time, we always seemed to be somewhere else when it started. But, I wish I did! It's a Finnish ritual where a therapist pours water infused with essential oil over hot stones. As the aroma releases, the therapist swings a towel to music intensifying the heat as you feel the benefits of scent and stone. The therapy lasts 15 minutes and it announced by a gong. 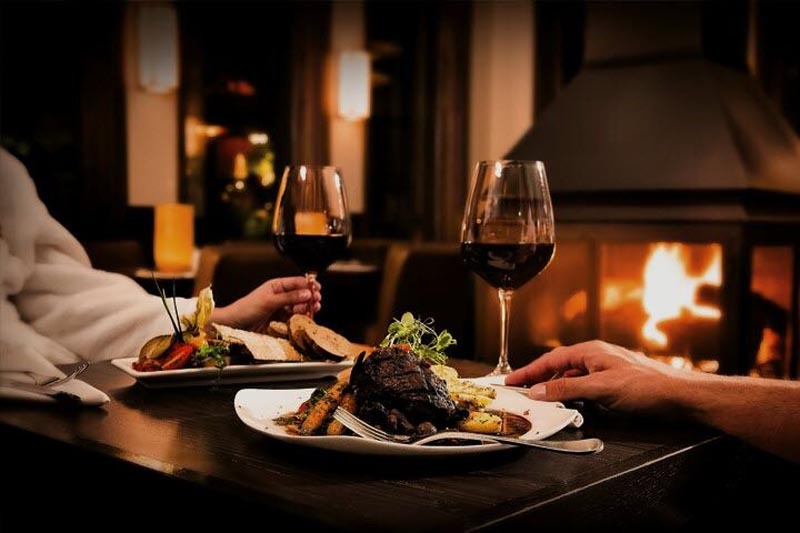 There are four restaurants to choose from at the Nordik Spa and you can eat while still relaxing in your cozy robes. You can dine on by the infinity pool while enjoying a glass of wine, beer or cocktail with snacks like grill cheese or tacos. You can share a cheese plate and wine at the Panorama or have lighter fare at the Mezz Cafe. 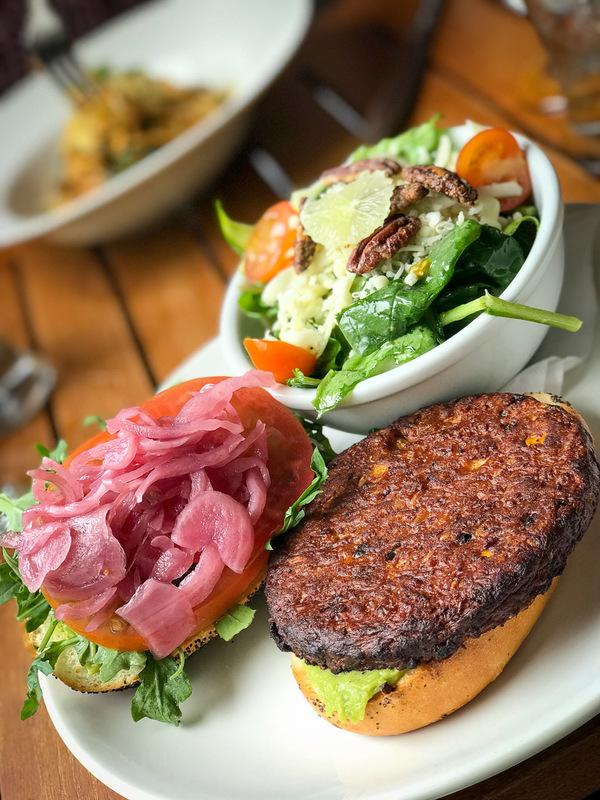 We ate at the Bistro Resto where they had a good selection of salads and vegetarian cuisine, and also offered gluten-free and locally sourced food. But don't worry, if you want beef, a burger or chicken, they serve that too. 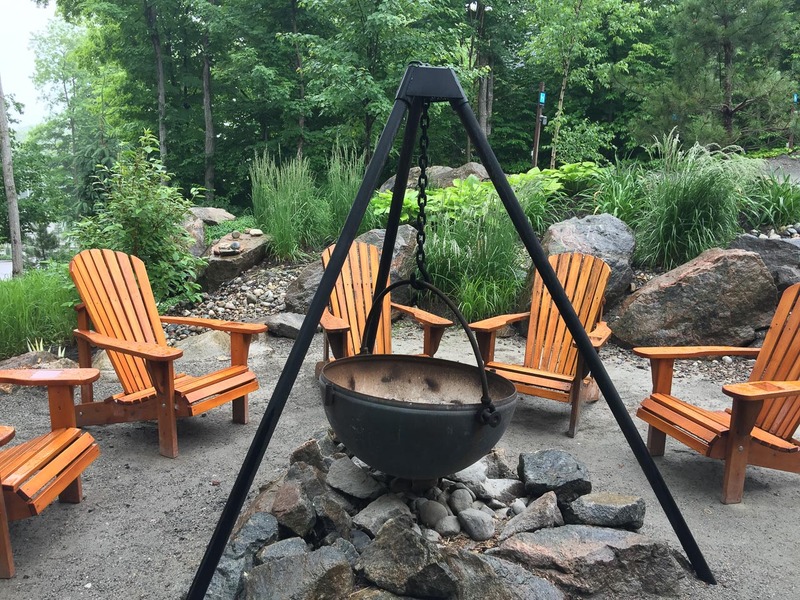 Our time at Nordik Spa-Nature was heavenly. It was amazing to be able to turn off for a few hours with nothing else in the world to worry or think about. We just focused on our health and well-being and it set us up beautifully for our Ottawa adventure in the week ahead. If you are visiting Ottawa, make sure to put Nordik Spa in Chelsea at the top fo your list! Wrist Bands – Provided to unlock your locker and get you into treatments you paid in advance for. 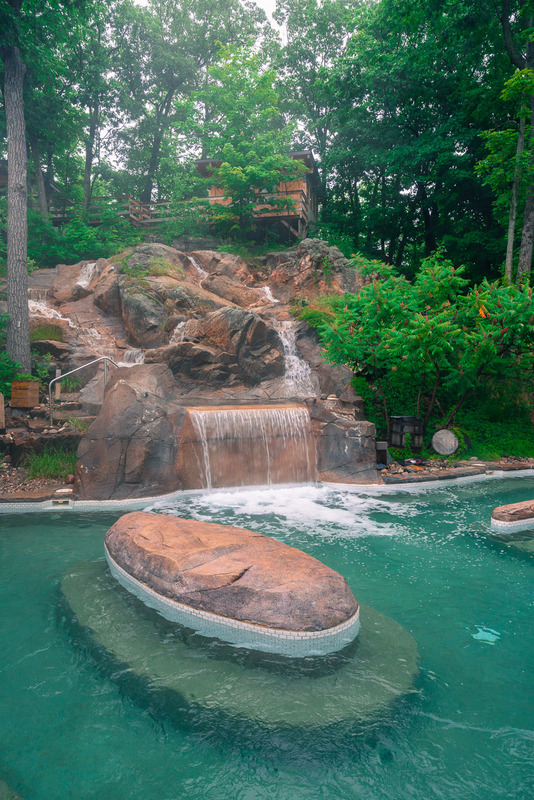 There are three different areas of the Nordik Spa. Be sure to respect privacy and quiet. socializing area for conversations and drinks by the pool. We didn't do a spa treatment at Nordik Spa, so we cannot comment on how good they are. But you can book treatments from deep tissue massages to Thai massages. They offer facials, foot treatments and detoxifying treatments as well. You can be sure we will definitely be back again and try a massage. Friday and Saturday 9 am – midnight. Visit Nordik Spa for more details. Our trip to Ottawa is in partnership with Tourism Ottawa. All opinions are our own. 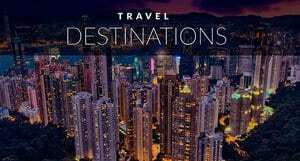 Visit their website for more information on travel to Ottawa. 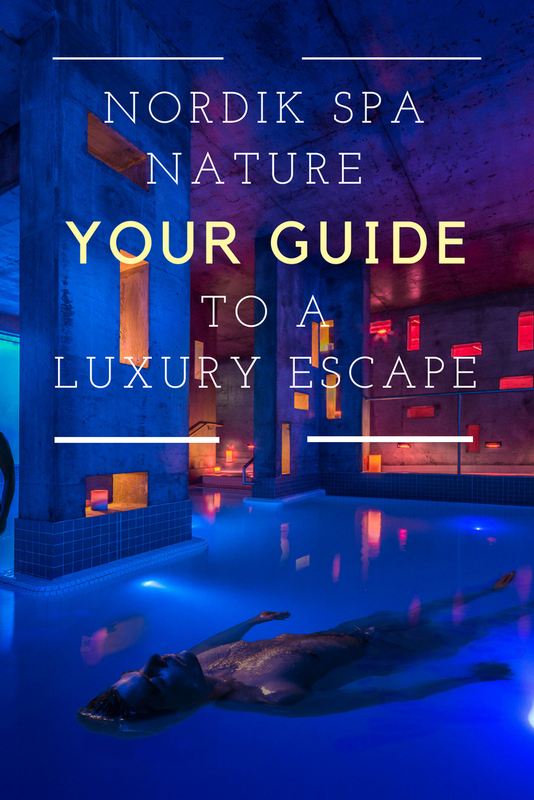 12 Responses to "Nordik Spa Nature – A Guide to Ottawa’s Luxury Spa Escape"
It looks an amazing experience! Spa is Amazing place for relaxation. 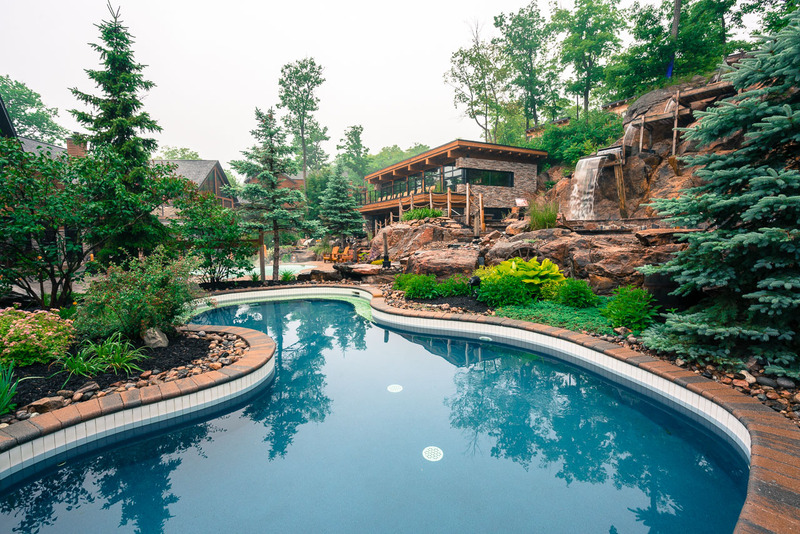 Good Work, Very informative Article about Nordik Spa Ottawa, Thanks for sharing. I love luxury travels, so this spa in Ottawa looks like the perfect destination. The setting is amazing, the location superb and it looks like also the services offered. Thank you for sharing your experience. 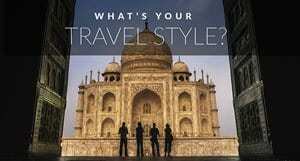 Now I am using my guide https://bit.ly/2ms2Bo5 to research flights, because I like to tavel with all comforts, but why to spend more than enough?! Gosh! this spa looks so relaxing. I have to check it out now for sure. Thanks for sharing mate. it seems that you enjoyed this luxury trip, even this time me too planning to go somewhere like this and want to enjoy vacation. thanks for sharing good place for spa. All these pictures are amazing! I would go there just for the infinity pool and sauna. Simply stunning. The captures are amazing and so is the Spa. Loved it. Thanks for sharing. Nordik Spa-Nature the ultimate relaxation experience I had, that was an amazing feeling I can’t explain. I was at the Spa Nordik a few years back and I swore I would return with my husband. The first time it was a girls getaway with my two daughters and a good friend. We spent the day relaxing and catching up. 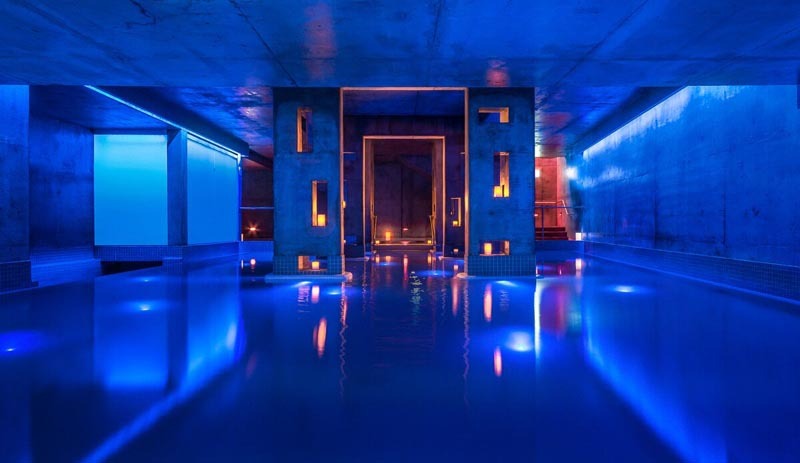 It has to be the best Nordic spa experiences that I’ve ever had. I love the different pools, the steam baths, the cold water plunge pools but the best was the infinity pool sipping on a cocktail. Just amazing. I need to go back!